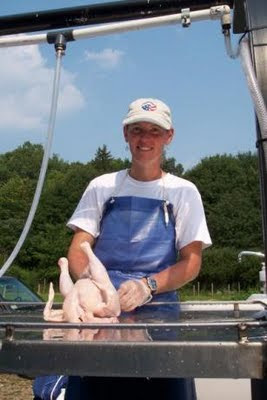 Tom Laskawy features my Friedman School colleague Jennifer Hashley in his fascinating Grist article about an innovative poultry processing operation sponsored by Whole Foods. It isn’t only small producers who are feeling the pinch—a widespread lack of processing infrastructure appropriate for small farmers has caused supply chain problems for the big retailers as well. Whole Foods—the world’s largest natural-foods supermarket—wants to aggressively expand its local meat sourcing, according to its head meat buyer, Theo Weening. But it faces the same limitation as Hashley. Most regions of the country have “lots of agriculture but nowhere to process,” Weening told me, adding that the phenomenon is most acute in the northeast. Whole Foods wants to change all that. In a move that has national implications, the retail giant has confirmed to Grist that it is working with the USDA as well as state authorities to establish a fleet of top-of-the-line “mobile slaughterhouses” for chicken. Starting with a single unit serving Massachusetts, Connecticut, and the Hudson Valley, N.Y. area, Whole Foods hopes to offer small farmers an affordable way to process chickens as well as to vastly increase the amount of locally-sourced chicken it sells. If successful, this program could be expanded to any region of the country with similar infrastructure shortages. See an earlier post about Hashley's work. Science doesn't work despite scientists being asses. Science works, to at least some extent, because scientists are asses. Bickering and backstabbing are essential elements of the process. Haven't any of these guys ever heard of "peer review"? ... That's how science works. It's not a hippie love-in; it's rugby. Peter Watts implies that the bickering and backstabbing in the recent email disclosures are a good thing. But science usually works better than this. Though it is true that all scientists gossip and complain about peer review, science is usually more cooperative than rugby. Rugby is a zero sum game. Science is usually a positive sum game, where each team's discovery advances that team's interest in part and the collective interest of all competing teams in part. There a couple reasons why the climate scientist's emails showed more bickering and backstabbing than usual. Climate science is more intertwined with partisan politics than most science is, and the future of civilization is at stake. I think those folks are playing a rougher ballgame than scientists usually play. In contrast with Peter Watts, with hindsight I think they would all have scored better if they had played a more fastidiously high-minded game. More American households had difficulty putting enough food on the table in 2008. The federal government's annual report on U.S. household food insecurity and hunger is expected to be published today at noon. The new statistics will estimate hardship in 2008, based on a national survey last December, which asked respondents about their experience in the preceding 12 months. The report will be posted to the front page of USDA's Economic Research Service. I have two suggestions for media coverage of this report today: (1) report the contrast between the official estimates and national objectives for hunger reduction, which were adopted during the 1990s, and (2) report the simple percentage of U.S. survey respondents who experienced hunger, based on a straightforward and eloquent single survey question found in the appendix to the annual report. Taking cues from the report itself, press coverage in past years has focused on small year-to-year changes in the prevalence of household food insecurity. For example, last year's report showed that 11.1% of households were food insecure in 2007, up an insignificant 0.2 percentage points from the year before. 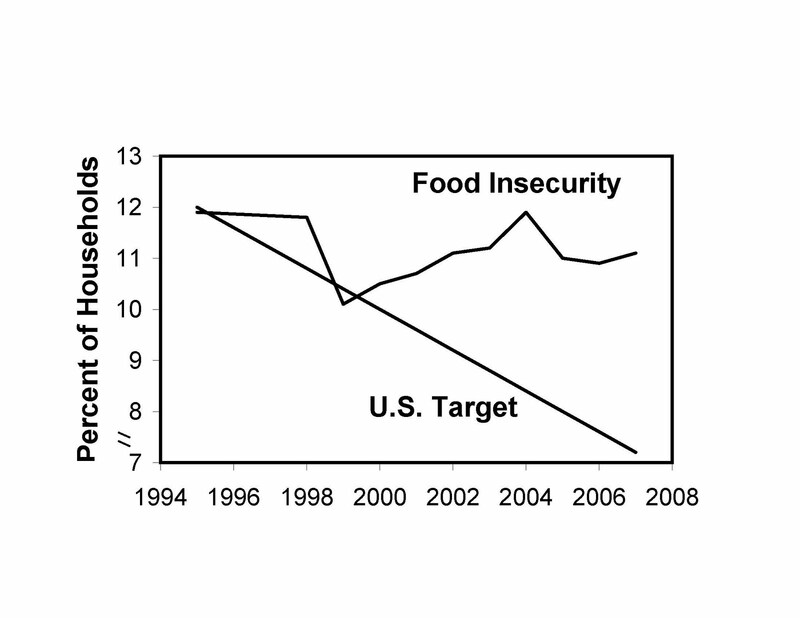 I hope today's press coverage focuses on a more meaningful contrast: each year's official estimate of food security has fallen further behind the planned improvements that the United States adopted in the 1990s as national objectives for 2010. The national objective in the Rome Declaration, and the Healthy People 2010 plan, was to reduce food insecurity by half. When the new report is published today, we can add another data point to the chart below. The failure to reduce food insecurity in the United States provides an interesting backdrop to the new Rome food security summit in news reports today. It is sometimes said that the federal government no longer reports an official measure of "hunger." 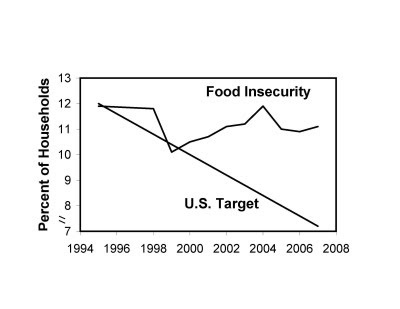 Beginning with the 2005 report, the federal government changed the name of the classification formerly known as "food insecurity with hunger," and now labels this category "very low food security." However, I have always appreciated the question in the annual survey, which asks whether the survey respondent was hungry but didn't eat because he or she couldn't afford food. In recent years, this statistic has been reported in appendix Table A-1 of the annual report. In contrast with many of the complex statistics cited in the academic literature on food security measurement, this simple hunger count speaks most clearly about the prevalence of hunger in America. In 2007, the respondent reported such hunger in 3.3% of U.S. households. 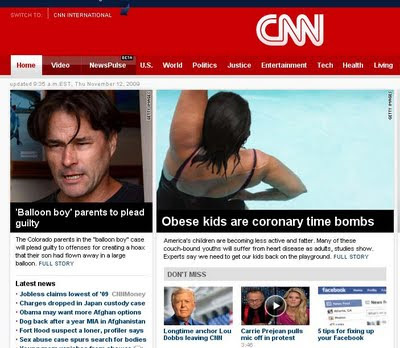 CNN calls obese kids "coronary time bombs"
The top story on CNN online this morning has the headline: "Obese kids are coronary time bombs." What is your opinion of that headline? It is good to be frank about the health consequences of childhood obesity, to motivate a vigorous response from parents and policy-makers alike. At the same time, we should respect and support the quality of life for the many children who will be overweight for much of their lives. It seems helpful to say, as an expert quoted in the body of the CNN article does, "Our study suggests that more of these young adults will have heart disease when they are 35-50 years old, resulting in more hospitalizations, medical procedures, need for chronic medications, missed work days and shortened life expectancy." But it seems unhelpful to call obese kids time bombs. It's stigmatizing. As a metaphor or image, "time bomb" doesn't bring to mind a correct impression of the health consequences as a scientist would see them. The article seems at times to be concerned about the teasing that heavy kids get in school, but that nuance is not carried through consistently. The "coronary time bomb" language was not from any of the experts quoted or evidence cited, but was in the CNN author's own voice. The article is supported by direct advertising for an anti-cholesterol drug, Vytorin. Clearly, the advertising is linked with the content of the article. The fear-enhancing message in the article text serves well to generate interest in the ad. The ad has the same color scheme as the CNN website, increasing the visual sense of linkage. The teaser for the ad is: "What are you doing about cholesterol and the Two Sources -- food and family?" VYTORIN contains two cholesterol medicines, Zetia (ezetimibe) and Zocor (simvastatin), in a single tablet. VYTORIN has not been shown to reduce heart attacks or strokes more than Zocor alone. VYTORIN is a prescription tablet and isn‘t right for everyone, including women who are nursing or pregnant or who may become pregnant, and anyone with liver problems. Unexplained muscle pain or weakness could be a sign of a rare but serious side effect and should be reported to your doctor right away. VYTORIN may interact with other medicines or certain foods, increasing your risk of getting this serious side effect. So, tell your doctor about any other medications you are taking. It seems that food policy folks are all expected to pick sides about genetically modified organisms (GMOs). But, exactly what question are we picking sides on? Could there ever exist a GMO technology worth supporting? Are current oversight systems inadequate to protect against food safety failures and environmental harms? Do current GMO technologies promote increased chemical use? Have current GMO technologies been oversold prematurely? Does the current regime of intellectual property rights favor multinational corporations over farmers? I have no answer to Question A right now. I'll find out the correct answer in a few years. Here's where I am more confident: If you oppose GMOs, it benefits you to remain friendly with everybody who shares your answers on Question B, regardless of their answer to Question A. After months of saying that the H1N1 flu had not been found in the U.S. swine herd, USDA in October reported that the H1N1 flu virus was found in swine at the Minnesota State Fair. At the time, USDA reassured the public that this news did not indicate flu would be found in commercial herds, "because show pigs and commercially raised pigs are in separate segments of the swine industry that do not typically interchange personnel or animal stock." This month, USDA found the virus in a commercial swine herd in Indiana (.pdf). USDA may need to update its frequently asked questions page (.pdf). The website document still contains the sentence: "To date, the 2009 pandemic H1N1 flu virus has not been found in the U.S. swine herd." However, a notation in red has been added to the top of several pages, saying, "as of 9/1/2009 9:58 PM," apparently to indicate that this statement is no longer current. The CDC's frequently asked questions page, dated November 5, contains the question, "Why is 2009 H1N1 virus sometimes called “swine flu”?" The response indicates that the term "swine flu" is incorrect, because "further study has shown that this new virus is very different from what normally circulates in North American pigs." Depending on how one defines "normally," this page may also need editing. USDA has previously asked people not to call the H1N1 flu by the common name, "swine flu." The National Pork Board provides reassurance that you cannot get the flu from eating pork products. Instead, the virus is transmitted from humans to commercial swine when the pigs catch the flu from farm workers. It is possible that the virus is also transmitted from pigs to humans in a similar manner. The H1N1 flu in swine has been covered by David Kirby at the Huffington Post, Tom Philpott at Grist, and, just today, the New York Times blog Green Inc.